I decided to start a build thread of my new CMP P28 Piper Arrow that I just purchased from Nitro Planes. This plane was purchase for 110.00 shipped to my house after 5% online coupon. I purchased the model on Sunday 27 Feb and it arrived 3 Mar! Everything was working out great got a good deal anq lightning fast shipping. The box was visibly damaged and looked like UPS ran over the darn thing. Of course I then inventoried what I got and found a whole lot of damage in which I will post pictures of tomorrow. So I instantly got on the phone with Nitro Planes! After to speaking with the operator I emailed samraiden@gmail.com! I was told that he was the supervisor who I needed to contact about my problem however to the day I have not gotten a response. So I went to plan B and posted my problem on rcdiscuss.com and spoke to Eric a costumer support representative. He quickly responded and sent me a tracking number for the fuse, canopy and cocklit that he just sent to replace it. All things considered all will turn out well. It is do to arrive 9 Mar. So I am keeping my fingers croseed until then. Here are the pictures of damaged airplane that I got in the mail. Hopefully I my parts arrive in better shape this time. Once I get the new parts I will begin the build thread. If the inside box was that badly bent, I can imagine what the shipping box looked like! Mine came with a broken rudder and badly broken canopy. I repaired the rudder easily, but I asked and received a replacement canopy from Eric. I'm in the process of building the plane now... I'm installing lights at the moment. BTW: What motor and battery combo are you going with? I'm thinking of using a Monster Power 32 that I have with a 70A ESC running off of 4000mAh 4S 14.8v packs. I actually went with the Monster Power 46 with a hobbyking 90amp ESC and 5s 3000 mah blue lipo. Plenty of power but I still have flown it yet. I still need to get retract servos and finish the linkage to the nose steering. I have so many projects going that is why it has taken so long. I also just purchased the Honda Jet 420 from nitroplanes.com. Awesome looking plane. Cant wait till it gets here. I've had MANY flights using a Monster Power 32 on mine. My plane originally tended to climb A LOT above a certain airspeed... so much so that it seemed to be tail heavy when it was not. 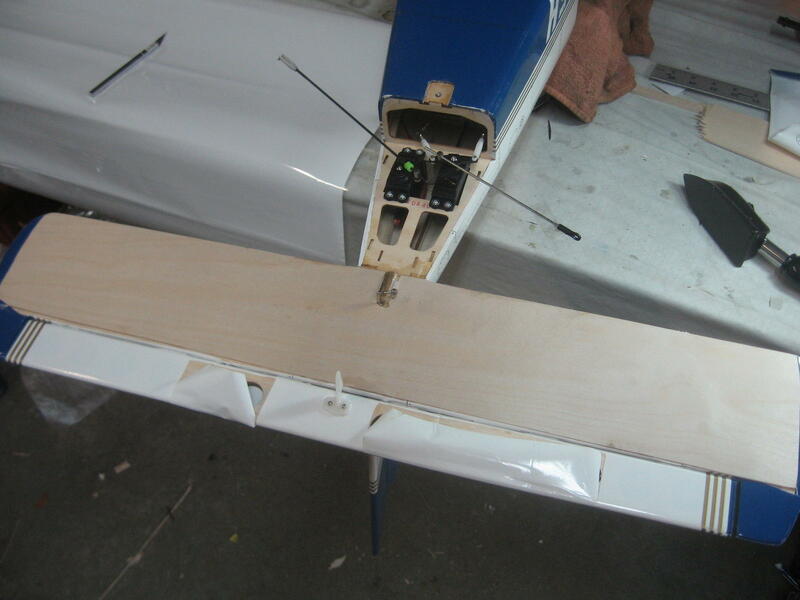 I dropped the wing incidence on the leading edge about 1/4". I did this by inserting a 1/4" piece of wood the the top part of the forward wing mount slot, and cut away 1/4" of material from the bottom. Now the plane flies PERFECTLY.... no hard nose up, or hard climb unless I want it to. I'm flying it with a Monster Power .32 ( a PERFECT MATCH! ) and a 12x7e prop using 4S 14.8v 4000mAh packs. Flight times are well over 10 minutes. Make SURE you use a pair of identically branded low profile retract servos, one for the mains and one for the nose. You'll have to file out some material to get the servo to fit on the nose, but the included retracts will work perfectly this way. I hardened the mount area by temporarily removing the retract, then soaking everything around the mount in thin CA. This worked great. I then re-installed the retracts using slightly wider screws than those provided. A GREAT flying plane with the above fix. I've also recieved my P28 damaged and I'm waiting for Nitroplanes to replace the broken canopy. I've been waiting about a month so far. Question #2I'd like to buy self contained retracts and the $10. ones reccommended on this forum are out of stock and have been for quite a while, I found these which are pretty reasonable and there's also a steering retract available, my question is, would these work/fit on this plane? That's it for now, any help or suggestions would be greatly appreciated, the manual doesn't tell you much. Post a note in the stickied thread at the top of the forum and also over at rcdiscuss.com in the CRM section for Nitroplanes. Make sure your post is titled with your order number and "Broken item" to get everyone's attention. Have you done this sort of thing before? What is your experience level? The motor mounts to the "X" metal plate, that plate mounts to standoffs that you can obtain anywhere. I used plastic standoffs I picked up at a local hardware store in their misc hardware metal display boxes. You put the motor onto the "X" then temporarily tack glue the standoffs onto the plate. Put the motor into position with the fuselage pointed straight up, and center the motor on the firewall/box. Finally carefully slide the canopy over the motor being careful not to nudge the motor out of position and make sure everything lines up and looks right. The page you linked to shows electronic retracts that may work. Frankly I'd use the included retracts. They have worked flawlessly for me. However you DO need to get two retract servos to use them, and stiffer wire. You also need to remove the existing servos, CA ALL of the wood in the area the retracts mount, and let it fully dry overnight before re-installing the retracts with LARGER screws than the puny ones provided. The provided wires do work using standard retract servo, but I bought some slightly thicker wires from my LHS and used that instead. I also used quick connects to secure the rods to the servo arms, to make the retracts easy to adjust. I also added custom gear door covers, made out of spare X-Ray sheet plastic, some modeling plastic, and pop rivets. I cut the thick white X-Ray sheet plastic to make the doors. I used the LHS modeling plastic to make 1/4" x 1" squares that I bent into "U"'s around the strut. A bit of heat with the plastic on a table, around a dowel, let me bend them to shape... and the "ears" of the plastic were rivetted to the doors for an authentic look. After installation a bit of CA keeps the new "doors" from rotating on the struts. They have worked well and have never fallen off... the cover the provided struts to the point I've never bothered with scale ones. First of all thank you so much for your in depth reply. It was very helpful. I know I sound like a dummy but I'm not sure where to find the "stickied thread at the top of the forum " I will defpost the "Broken Item" note in RC Discuss. Thanks for that too! My experience level I would say is intermediate, I've built helis and planes but this is the first scale plane and it seems that the manual doesn't give much in the way of detailed instuctions, just diagrams, kind of like an Ikea building plan. Thankfully we have these forums and people like you that are willing to take the time to help others. You rock! Have a great week end! That motor sounds a bit too anemic for me. Using a 4S setup would put you in the right power range, but the KV rating means that the prop will spin @ 16500 RPM which is unrealistic for an EP plane of this size. I fly mine with a 4S setup using 4000mAh packs and I am quite happy with it's performance. 15v x 900kv = 13500 with no prop and around 12000 RPM or more when the plane unloads in the air. An 11x6e prop ( according to ThrustHP ) should put you in the right max draw range for that motor, and if not a 12x6e or 12x5e would do the trick.... though you should monitor power consumption with a Watt meter on a static test to be sure you will not blow the motor in the air. With the motor you selected the maximum diameter you could use to stay in spec would be a 9" prop, a 9x6 would only produce about 4lbs of thrust however so the plane may be anemic. The second motor with an 11x6 should pull about 6.4lbs or so, putting you at greater than 1:1 thrust, assuming a 12,000 rotation rate with the prop and the plane in the air. Novices soon find that spinning a prop faster results in more power, so they immediately assume that a higher KV motor produces more power. This is "backward" thinking. Yes turning a prop faster draws more power and produces more thrust, but the motor has to be capable of the demands. Doing so ends up pushing more current through the motor than it can handle. Upping the voltage and lowering the KV while using a larger motor and an appropriate prop will produce more thrust safely. Think of KV as "gear" in a car... if the gearing is two hgih ( e.g. 1:1 like fourth gear in your car ) the engine will never be able to operate in the right power range and ends up lugging the car/plane around without ever getting up to speed. Lower KV = Lower gear = more "pull"... though this is a very loose analogy. Thanks for the indepth explaination of my motor situation, I think I'll try to exchange the one I have for the 900kv version or else I'll just buy it. Strange thing about the motor I have is that the bolt pattern is odd, offset, not a square pattern so I can't imagine the mounting plate fitting. I'll see when the adaptor gets here. (Still not sure what I'm gonna do about the retracts, I've read that if I want the wings to be removable I can't use the retract system that comes with the plane. Again, thanks so much for your advice, it is now part of my building plans. Have a great day, (You probably haven't heard the last of me. The wings are glued together and form a single wing unit. You can remove the wings from the plane, which leaves the servo on the wing itself along with all of the interconnects. You merely have to disconnect a bunch of cables... e.g. flaps, ailerons, retract servos, etc. However without the wings, the plane becomes difficult to stand upright with the retracts down.... so I carry my plane to and from the field intact. If you pull up the retracts before removing the wings, things are easier however. Oh, I didn't realize the wings will be glued..my plane is wrapped under our Christmas tree, my wife won't let me play with it till Christmas. If I can use the retracts that come with the kit and still remove the wing that works for me. Thanks again. Question? Is this battery ok for my plane if I use the motor you recommend? I ordered the 900kv motor. That's a 4000mAh 20C rated pack with a rated 30C burst. 80A x 14.8v = 1184 watts.... so you have plenty of overhead there. Let's assume that you only run the plane @ 15C most of the time. 15C x 80A = 888 watts. So if you run the motor at max capacity ( full throttle ) ALL of the time, your pack should remain quite cool. Normally you'll only need 70-78% throttle throughout your flights, so you'll get good runtimes and a long pack life. Wow that's great, Thanks for breaking it down. Will I need a BEC or a seperate battery for the servos? I see some builders have a 2 cell battery added. Also, what size servos do I need for the retracts? @ correct? The actual power draw is determined by the prop you use. Since you seem to be getting into electrics more than the beginner level, I HIGHLY advise you to obtain a good RC Watt meter... NOT an Ohm meter, etc... you want a Watt meter specifically made for RC use. A Watt meter will allow you to actually measure the amount of current draw using any prop and motor combo. Put everything together and tether the plane. Put the Watt meter in line with the battery pack ( note: you will likely need to make up connectors for both sides of the meter too... I suggest obtaining or making your own when you order or get the Watt meter ). Then run the plane up to full throttle for 4-5 seconds. Observe the power draw AFTER the first 2 seconds. That will give you MAX draw. If AMP draw does not approach or exceed the ESC's burst rating, everything is fine. The specs state only a 2A "overhead" on that ESC... normally in the 60A range the burst overhead is at least 10A or higher for safety. If the specs are correct ( and they MAY be in error! ) that means even though the ESC is rated for 60A, you really only want to use it for a 50A configuration. Those spurts can go quite high, which is why you want some overhead in the electronics. I usually factor in a 20% overhead. The ESC I used ( also from HK ) is rated at 70A, 80A burst. Complicating things though is the specs do not give what voltage the burst and max current is measured at. If 60A is for 22v, then you are probably perfectly fine running the plane at even higher AMP loads using a lower voltage. So again a WATT meter let's you make SURE everything will be fine. BTW: I'd start with a 12x6e prop and see how things go. If you want a bit more speed, move up to the 12x7e prop AFTER you check things out with the meter. It is likely you can also move up to 13x6e too, but only after checking. The ESC includes a "switchmode" ( switching ) BEC so you do not need a separate BEC. BTW: Go back a few of my posts and you'll see that I had to adjust the wing incidence. The plane was difficult to control because of the climb, on my first flight. I recommend you do the same thing. Dropping the flaps will balloon the plane up even more, but after the incidence change, I mixed in about 6 point drop in the elevator ( nose down - this is like a click or two of elevator down trim ) whenever the flaps are actuated. Now I can drop the flaps half way on approach and the plane remains level, I then drop the gear and land. Only once the plane is on the ground I drop the flaps all the way to slow it down. I recommend you keep the flaps up on the first landings as you get the gear right... my gear didn't lock in the first time and they collapsed in, scratching up the TE of the flaps ( later fixed ). After adjusting the rod settings the gear now lock in each time. You need TWO standard retract servos. Retract servos rotate 180 degrees. They are non-proportional. They are also low profile and will fit the provided areas perfectly. A full size standard servo would not fit, a Mini servo required extensive modifications and did not work well. When I changed to a standard retract servo everything came together perfectly. You are forced to adjust the position of the quick connects on the servo arms to get the right amount of travel, and you use the quick connects to set the pushrod location. The latter is easy to do, as you can manually move the gear into the up or down state, and then lock down the grub screw. The pushrod fits through the provided wheel well holes just fine. 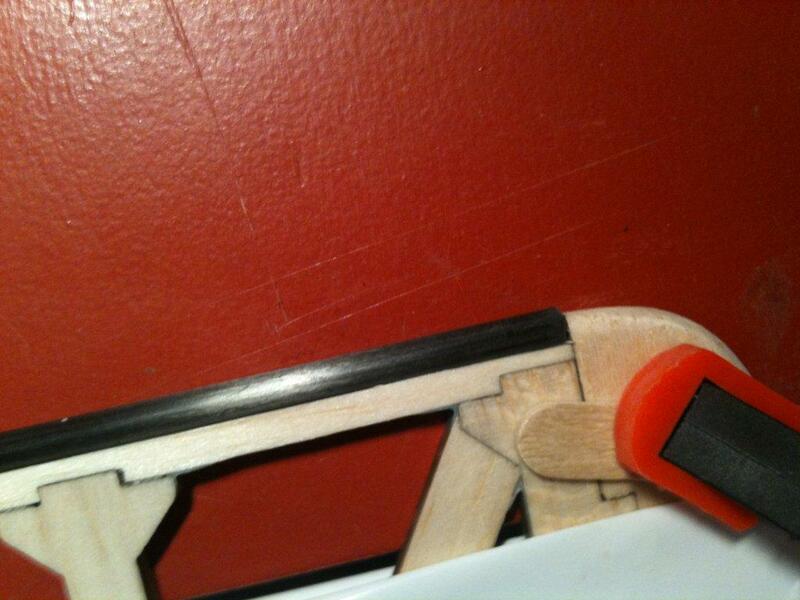 Do harden the gear mount area as I indicated, and beef it up a bit if possible using tri-stock and some extra ply. I gave the gear hold down screws extra "bite" area by installing a doubler behind/under the existing mounting wood. I get a lot of comments about how well this plane flies and how good/scale it looks flying and landing. Thank you thank you thank you again! I will be printing all of the information you've generously offered and will be using it as a suppliment to the manual. Did you modify the stableizer or rudder as is recommended by some of the other builders, especially the guy who's tail folded in half during his maiden flight. If so, which method did you use? Ply or carbon fiber rod? No I haven't modded the tail though I did consider doing so given it's rather large size. CAREFULLY cut a divot or tube area to insert sufficiently thick CF rod and glue the CF rod in place from the bottom of the elevator, then cover with white covering. Remember that any such rod does NOT have to transverse the entire elevator to provide additional strength. Even adding a CF rod that protrudes only 1/3 of the way in from the elevator root into the elevator wing area, alone is enough to add a good amount of strength, and 1/2 way in will provide maximum structural strength without damaging the look. Here are a couple of mods I found but I think I like your idea with the cf rod going half way out. On one particular plane I had assembled the plane and flown it. The elevator was not removable after assembly as it was glued in place. I did not feel like damaging the already built plane but I felt that the elevator needed additional re-inforcement. So I cut a small hole, large enough to feed a CF rod through, at the root of the elevator all the way through the fuselage, positioned to permit a CF rod to sit parallel and resting on the elevator bottom. I installed the CF tube temporarily and cut off a bit of covering to provide adhesion to the underlying wood. I then put epoxy on the exposed wood and slid the CF rod into place. The CF rod was about 60-70% of the entire elevator length and sat on the bottom side. If you looked closely at the plane you would see the re-inforcement rod, but most people never noticed. This worked great and I still fly this particular plane with the rod in place. The photos you uploaded are a bit drastic IMHO... I get the same effect with the rod far more simply. I agree, I will be using your technique but thanks to you my friend will have the advantage of doing it while building. Remember that you only need to cut out a thin sliver of covering to provide enough adhesion to the wood. The cut need not be as fully wide as the CF rod.